Delta is expanding in Boston with new service to San Francisco and Nashville, as well as more flights to Seattle and Milwaukee. By the end of 2016, Delta will be the only U.S. global carrier* to offer first class seating on every flight to and from Boston. By June 2017, Delta will have added more than 22 percent more seat capacity versus June 2014. Two daily flights to San Francisco International Airport – the largest market from Boston – using a Boeing 757-200 aircraft. One daily flight to Nashville International Airport using a two-class, 76-seat CRJ-900 operated by Delta Connection carrier Endeavor Air. Delta will offer the only first class service in the market. One Saturday nonstop flight to Montego Bay, Jamaica Sangster International Airport, using an Airbus 319 aircraft. One Saturday nonstop flight to Punta Cana, Dominican Republic Punta Cana International Airport (subject to government approval), using an Airbus 319 aircraft. One Saturday nonstop flight to St Thomas, U.S. Virgin Islands Cyril E. King Airport, using a Boeing 757-200 aircraft. 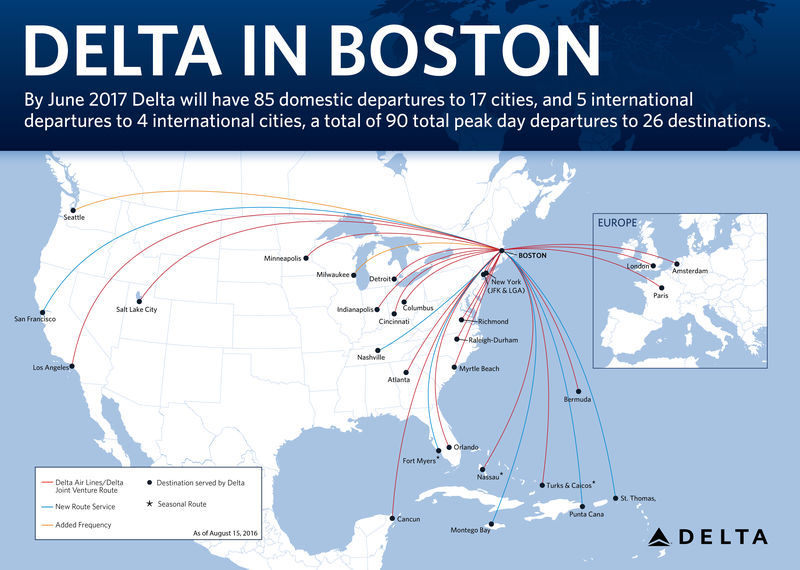 Additionally, Delta will add holiday service between Boston and Fort Myers from Dec. 22-Jan. 2 using a two-class, 76-seat Embraer E-175 aircraft operated by Delta Connection carrier Shuttle America. A second daily flight to Seattle-Tacoma International airport using a Boeing 737-800 aircraft. A second daily flight to General Mitchell International Airport in Milwaukee using a two-class, 76-seat CRJ-900 aircraft operated by Delta Connection carrier Endeavor Air. Beginning mid-December increased Orlando service with three daily trips year round. In June 2017, Delta will offer 90 peak day departures to 26 destinations. *U.S. Global Carriers include Delta, American, and United, and their respective regional and contract carriers. Delta is the No. 1 carrier between Boston and New York connecting business travelers with the Delta Shuttle, operated by Delta and its connection partner Shuttle America, with hourly service 16 times daily between Logan Airport and New York City’s LaGuardia Airport as well as offering eight daily flights to JFK. Delta Sky Club operates two locations in Terminal A providing customers with several healthy and fresh food choices and a number of complimentary drink options including local Samuel Adams craft beer and Starbucks coffee. THE BAR at Delta Sky Club offers wines and premium spirits. SkyMiles members can use miles for premium drinks with a swipe their boarding pass. On July 1, Delta began offering Delta Studio, the airline’s industry-leading suite of onboard entertainment, free for all customers on two-class aircraft. Delta operates the world's largest Wi-Fi-equipped fleet, with more than 1,000 connected Delta aircraft, including the airline’s entire fleet of 660 domestic mainline aircraft, Delta Connection two-class regional jets and 99 percent of its widebody international fleet. Delta offers more capacity to Europe from Boston than any other U.S. carrier, with service to hubs in London-Heathrow, Paris-Charles de Gaulle, and Amsterdam. The airline is the only U.S. Global Carrier to offer full flat-bed seats with direct aisle access in Delta One with Westin Heavenly In-Flight Bedding featuring a full-size pillow and quilted comforter, chef-designed cuisine and Master Sommelier Andrea Robinson's wine program and an upgraded TUMI amenity kit featuring Kiehl’s Since 1851 skincare products. Customers flying in Delta Comfort+ will benefit from up to four additional inches of legroom and 50 percent more recline than Main Cabin seats, as well as priority boarding and every customer will enjoy Delta Studio, which includes hundreds of complimentary movies, TV shows, songs and games and the ability to connect with Wi-Fi on every flight. Earlier this year Delta committed to investing 1 percent of its pre-tax profits in the local communities where its employees live and work. As part of that initiative, Delta will commit financial support to local organizations such as Marine Toys for Tots and Boston’s Children’s Hospital. Delta’s service history in Boston dates back to Aug. 11, 1933, when Boston-Maine Airways (later Northeast Airlines) began service from Boston to Bangor and Portland, Maine. Northeast Airlines merged with Delta in 1972.